The character of the military equine must necessarily be memorable, given the brutal circumstances of his surroundings. Those that are remembered, however, tend to have their traits and habits subsumed in the personalities of their famous riders. 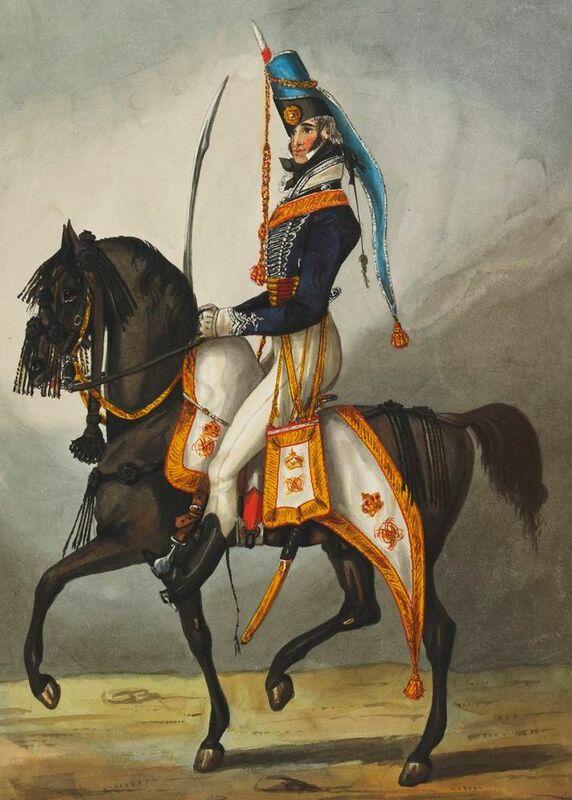 By the dawn of the Regency, and the Romantic age, an expanding literate population hungered for stories that centered on the personality of the military charger without regard to whoever was on her back. At this time, the French had superior cavalry, and Napoleon’s horses figured largely in the history of Regency-era chargers. L’Empereur had a deep, abiding relationship with his horses. He favored Arab stallions but also kept a few mares. All were required to be ‘sweet, gentle and reliable.’ Accounts relate how well his mounts were suited to him. 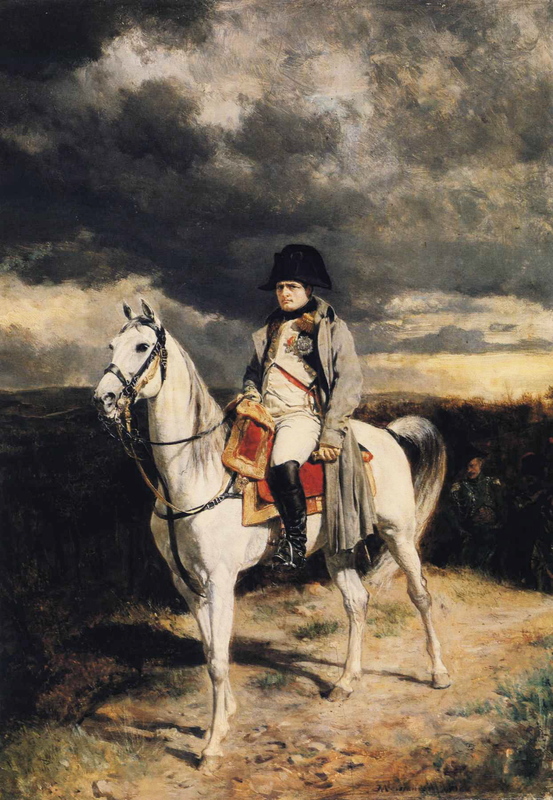 This was a good thing, for apparently Napoleon had a unique style of riding–one that combined effective direction while managing to appear as if he might fall off at any moment. Meissonier’s portrait below agrees with these contemporary observations. Napoleon’s weight is not centered, but pressing against a very sensitive area of the animal’s back, just behind the cantle. His heel is too far forward, and the reins are slack. It takes a special horse to remain balanced, not to mention sweet, when being ridden this way, particularly as Napoleon was known to take off suddenly, only to slide to a crashing halt while on the field of battle. Le Vizir, a favored mount, can still be seen today in Paris. He was stuffed after his death, the imperial N brand visible on his hip. Napoleon had pet names for his horses, a habit that gives us a window into their characters. Cirus, for example, he referred to as Austerlitz, for displaying uncommon equine valor at the famous battle. Another stallion he nicknamed Cuchillero, which means assassin. Coco was an affectionate reference to still another, meaning mate or friend. He called his mare Marie Zina, which means adultery. I’ve known a few mares who displayed remarkable tendencies toward the hussy end of the character spectrum. On the British side, the stories of Sir Thomas Brotherton’s mare Fatima are especially memorable. She was a pure Arab given to him by his father, on the occasion of his gaining a commission in the Coldstream Guards in 1800. Her exploits in battle are exquisitely illustrative of her character. Note the fly swatter attached to the horse’s bridle–Fatima, like many Arab-type chargers, had sensitive skin and required such a device to ward off biting flies. According to Col. Hamilton, this intrepid mare suffered several injuries in combat, including sabre cuts to the head. Undaunted, she would fight the enemy with her hooves and teeth. She saw action at Salamanca, when she was nearly put down from a grave injury to her stifle, but for the intervention of the stud-groom accompanying a noble comrade-in-arms. Other noblemen in service would offer fabulous sums of money to Brotherton to have her, including Sir Charles Stewart, brother to the Viscount Castlereagh, British Foreign Secretary. In the end, she was captured by the French Government, and carried away to the stud farm.